Following Vivian's initial discovery that S. coelicolor A3(2) strains carrying SCP1 inhibit those lacking the plasmid, Wright and Hopwood (1976a) identified the inhibitor as methylenomycin A, an unusual cyclopentanone antibiotic first characterised in S. violaceoruber SANK 95570 (to which S. coelicolor A3(2) is taxonomically close) by Haneishi et al. (1974). 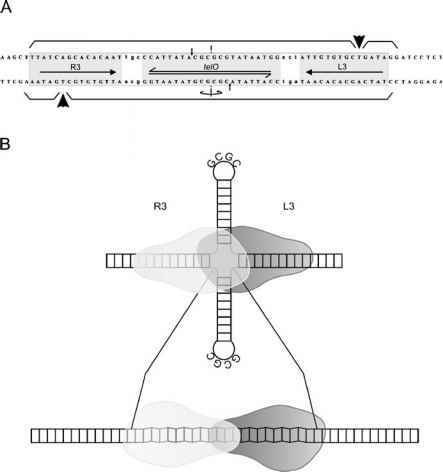 The demonstration that pathway genes for methylenomycin were indeed on SCP1 used a collection of non-producing mutants (mmy) (Kirby and Hopwood 1977). Different mutants had different phenotypes in relation to their ability to co-synthesise methylenomycin when grown close to each other, and could be classified as secretors, convertors or non-interacting. Critically, the particular pheno-types were 100% co-transferred with SCP1. Later, segments of mmy DNA were cloned from SCP1 in some of the first Streptomyces cloning experiments, using plasmid or phage vectors (Bibb and Cohen 1980; Chater and Bruton 1983, 1985), and probes from the cluster were shown to hybridise to SCP1 plasmid DNA (Kinashi et al. 1987). Eventually the entire 20-kb cluster was included in the complete sequence determination of SCP1 (Bentley et al. 2004) (Fig. 7). The mmy gene cluster of S. violaceoruber SANK 95770 also lies on a plasmid, pSV1, which is a large circular molecule (Okanishi et al. 1980; Aguilar and Hopwood 1882). The pSV1 mmy cluster is about 99% identical to that of SCP1 at the DNA sequence level (Chater and Bruton 1985; Yamasaki et al. 2003). (For comparison, most chromosomal housekeeping genes are around 90% identical between S. coelicolor and S. avermitilis, whose last common ancestor probably existed more than 200 million years ago (Chater and Chandra 2006).) Apart from the mmy genes and a set of parAB genes, SCP1 and pSV1 share little homology. Examination of the sequences around the ends of the conserved segment revealed no clues to the mechanism of transposition of the cluster between the replicons. This is not very surprising, as it has generally proved difficult to detect such features at the ends of chromosomally located antibiotic biosynthetic clusters, even though their sporadic occurrence suggests that many of them moved into their present host genomes by some kind of lateral transfer. Probably, such lateral transfer events generally took place long enough ago for most insertion-related sequences to have been lost. Recent studies have shown that the distinction between secretor mmy mutants and the single convertor mutant reflects the involvement of an extracellular signalling molecule ("M-factor") that controls the onset of methylenomycin biosynthesis (O'Rouke 2003). Biosynthesis of M-factor depends on a gene of a type, found in many other streptomycetes, that is critical for biosynthesis of gamma-butyrolactone signalling molecules (mmfL, Fig. 7). The most well known of these molecules is A-factor, which activates strep tomycin production in S. griseus (Chater and Horinouchi 2003). Such factors are thought to diffuse easily through membranes, and accumulate around and within the mycelium as it becomes more densely packed, until a concentration is reached at which the factor can interact with a factor-binding protein in the cytoplasm. The best known of these is the A-factor-binding protein specified by the arpA gene of S. griseus. The factor-binding proteins are usually repressors of other regulatory genes involved in activating antibiotic pathway-specific biosynthetic genes (Takano 2006). The mmy gene cluster includes two arpA-like genes for likely factor-binding proteins (mmyR and mmfR, Fig. 7). Thus, SCP1 and pSV1 both confer production of at least two bioactive small molecules on their hosts: M-factor and methylenomycin. Of course, the plasmid linkage of these attributes may have little particular adaptive significance, but it is intriguing that methylenomycin appears selectively to inhibit aerial growth, and hence sporulation, of SCP1- derivatives of S. coelicolor A3(2) (Vivian 1971). We may therefore speculate that methylenomycin production is programmed by the "quorum-sensing" M-factor to take place only when dense mycelium has formed, which is the preferred time for the emergence of sporulating aerial hyphae. At that time the inhibition of growth of SCP1- aerial hyphae would selectively favour reproduction of SCP1 + hyphae. The absence of such inhibition at earlier growth stages allows the growth of nearby SCP1- vegetative mycelium, which can potentially be infected by SCP 1 to aid plasmid spread. SCP1 also encodes some spore-associated proteins, SapC, D and E (Guijarro et al. 1988; Bentley et al. 2004; Redenbach et al. 1998). It has tentatively been suggested that these too may be associated with the need for SCP1-containing hyphae to be able to sporulate in the presence of their self-produced antagonist of aerial development (Bentley et al. 2004). A small number of other antibiotics structurally similar to methyleno-mycin have been identified (listed in Challis and Chater 2001), but as yet nothing is known about their genetic determinants or biosynthesis. It will be of some interest to know whether any of them are also plasmid-determined, and how their biosynthesis relates to that of methylenomycin. At 211 kb, pSLA2-L is the largest of the three linear plasmids found in S. rochei (Table 1). Using hybridisation probes for polyketide synthase (PKS) genes of two kinds, one often associated with macrolide antibiotics such as ery-thromycin, the other with polycyclic aromatic antibiotics such as tetracycline, Kinashi et al. (1998) found evidence that both kinds of PKSs were encoded by pSLA2-L. Sequencing and gene disruption experiments showed that the macrolide-related sequence was part of a large gene cluster for biosynthesis of the 14-membered macrolide lankamycin (Suwa et al. 2000). Completion of the pSLA2-L sequence by Mochizuki et al. (2003) showed that, astonishingly, about three quarters of the entire plasmid was occupied by genes for secondary metabolism (Fig. 7). Thus, in addition to the lankamycin biosynthetic genes and those for an as yet unidentified aromatic polyketide, those for a more unusual 17-membered macrocyclic molecule, lankacidin, were also present, as well as a further gene set for carotenoid biosynthesis. The plasmid also carried genes for the production of a gamma-butyrolactone factor (srrX, S. rochei regulatory gene X) and its receptor (srrA), and these were shown to be needed to activate the synthesis of both lankacidin and lankamycin (Arakawa et al. 2007). The remarkable conjunction of secondary metabolism pathways on pSLA2-L indicates that linear plasmids might provide a means by which different sets ofpathway genes can be brought into close proximity, in a context that might facilitate the evolution of new pathways by a natural version of "combinatorial biosynthesis" (a term applied to the artificial mixing and matching of genes from different pathways to generate new and useful metabolites; see Reynolds 1998, for a brief review). The co-regulation of two adjacent antibiotic production gene sets on pSLA2-L is also reminiscent of the situation in the S. clavuligerus chromosome, in which the adjacent gene sets for clavulanic acid and cephamycin C biosynthesis are controlled by a common regulatory gene (Ward and Hodgson 1993; Perez-Llarena et al. 1997). The actions of the latter two secondary metabolites are synergistic, since beta-lactamases that might destroy cephamycin C are inhibited by clavulanic acid. Another example of such a chromosomal supercluster is that for the production of the two-component antibiotic pristinamycin, although in that case the genes for pristinamycin A and B are intermixed rather than being in discrete adjacent clusters (Bamas-Jacques et al. 1999). Perhaps, then, lankacidin and lankamycin may also have synergistic action. Moreover, their apparent regulation by a quorum-sensing molecule might imply that, as hypothesised for methylenomycin, they provide an advantage to pSLA2-L-containing organisms that is best expressed after the main growth period, so avoiding inhibition of the vegetative growth of possible recipient streptomycetes, which might prevent pSLA2-L transfer. As in the case of methylenomycin, no clues to the mechanism by which the different clusters arrived in pSLA2-L could be divined from sequence analysis.